Tag line: "The most terrifying film you will ever experience"
OK, its confession time: unlike a good many fans of the genre, I have no problem with the recent trend of horror remakes. Sure, John Carpenter’s Halloween is a classic. It’s the movie that kicked off the ‘80s slasher craze, setting the standard for the entire sub-genre, but I also enjoyed Rob Zombie’s take on the story. Romero’s Dawn of the Dead is on my all-time Top 10 list, yet I thought the 2004 Zack Snyder version was entertaining as well. Hell, I even liked the recent remakes (or “re-imaginings”, or “updates”, or whatever you want to call them) of Friday the 13th and A Nightmare on Elm Street. 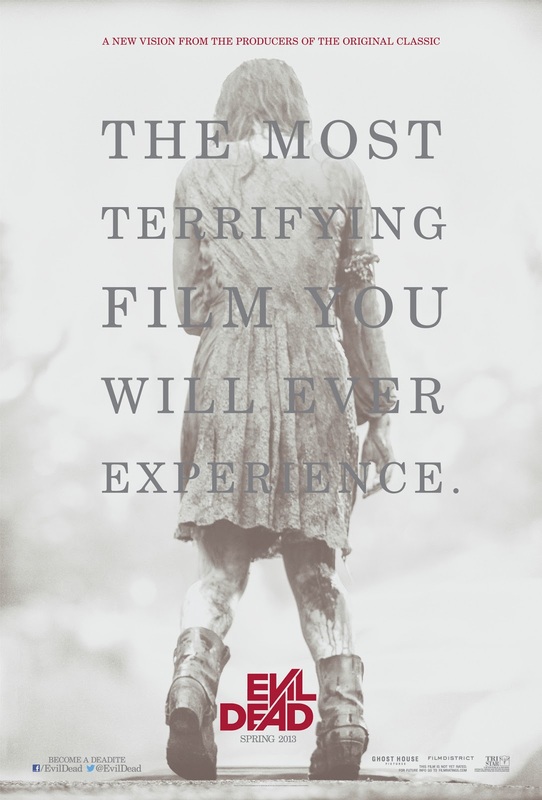 But that said, 2013’s Evil Dead, based on Sam Raimi’s unforgettable 1981 movie, is easily my favorite of the bunch. Trying to kick her drug habit, Mia (Jane Levy) travels to a run-down cabin in the middle of the woods, where she plans to go an entire weekend without getting high. Her friends Eric (Lou Taylor Pucci) and Olivia (Jessica Lucas) accompany her for moral support, yet the big surprise comes when Mia’s estranged brother David (Shiloh Fernandez) turns up with his girlfriend Natalie (Elizabeth Blackmore). Hoping to make things right with his sister, David promises Mia that he’ll stay by her side. Things take a bizarre turn, however, when the group stumbles upon a book, one that’s bound in human skin and written in blood. Unable to control his curiosity, Eric opens the book and starts reading it, and in so doing awakens a few evil spirits, who proceed to turn the friend’s weekend getaway into an all-out battle for survival. Produced by both Raimi and Bruce Campbell (who played Ash in the original), 2013’s Evil Dead is a gore-filled re-telling of the ‘81 indie classic. And when I say “gore filled”, I’m talking tons of gore, with blood spilling by the gallon. For most of the movie, we’re bombarded with shootings, stabbings, dismemberments and self-mutilations (one character even licks the edge of a knife, splitting her tongue in half). But, fortunately, Evil Dead is more than a simple gorefest; the film has some genuinely creepy moments as well. In the opening sequence, we witness a ceremony designed to rid a young girl (Phoenix Connolly) of the demon living inside her, a crazy, violent showdown that gets things off to a bone-chilling start. However, the film’s most tension-filled scene comes when Mia, realizing the evil is with them in the cabin, is cowering in her room, attempting to warn David of the danger they’re all in. Naturally, David, believing his sister is having an hallucination as a result of her self-imposed rehab, refuses to help, and once he leaves the room, we see just how real Mia’s so-called “hallucinations” are. 1981’s The Evil Dead will always be one of my favorite films. Nothing will change that. 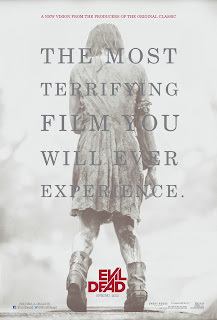 But I have to say I really enjoyed this new Evil Dead, and when I’m in the mood for a bloody good time, chances are I'll watch this one again.